I saw the following on Facebook and it was so apt I thought I would share it here. It was originally posted by Bob McMillan and if you like his writings you can find more of them over on his blog, The Wild Stare. 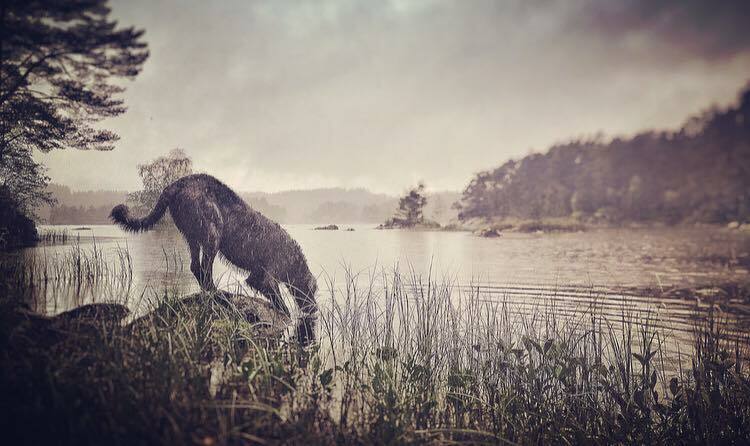 I’ve added some photos by Anne-Birgitte Larsen which beautifully demonstrate the majestic and mysterious nature of these wonderful hounds. Can you meet a wolfhound’s inner needs, too? 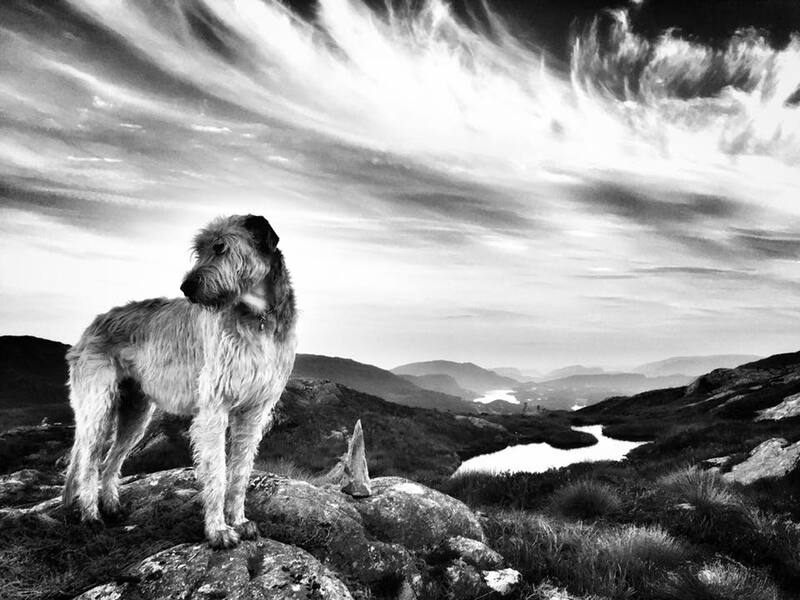 Do you have the compassion, patience and heart to nurture the soul of the Irish wolfhound? It’s no trivial matter. The Irish wolfhound is a companion unlike any you’ll ever have. This has been the conclusion of people who’ve written about the wolfhound for as long as there’s been writing. I recently came across a rare book, Edmund Hogan’s “History of the Irish wolfhound,” which was published in 1897 and was almost immediately lost to a fire at the publishing house. It was reprinted in 1933 and is a treasure of insights into the breed down through history. Hogan, a Jesuit scholar, collected every written reference to the wolfhound from antiquity through the end of the 1800s when the breed had just been brought back from extinction. There’s a thread that runs through the milennia. 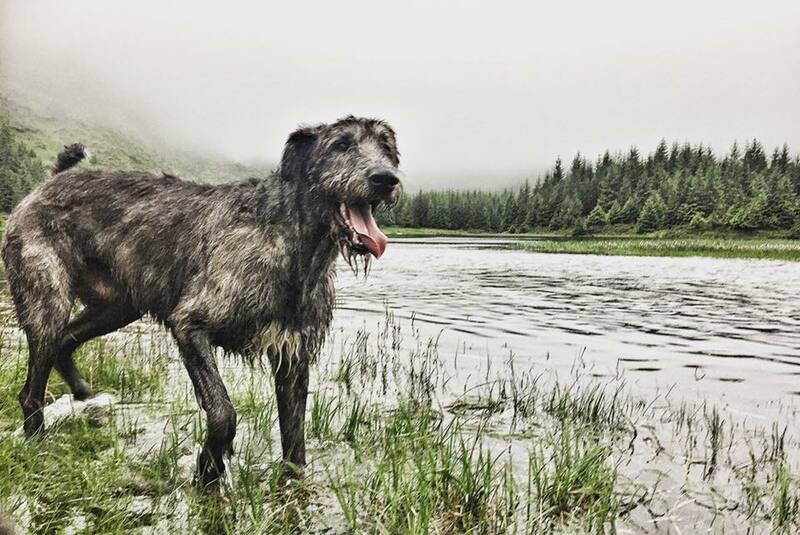 It’s something observed again and again by kings and commoners, Imperial Romans, Viking princes, Irish heroes and people across Europe over the centuries: The Irish wolfhound is practically human. Here is a hound who was once the terror of the battlefield. They pulled knights from saddles and brought chariots crashing to the ground. They were formidable hunters, able to outrun and overpower wild wolves and shake them to death with their powerful jaws. They’re a creature out of myth and legend. Yet, here’s a strange thing. Writers from antiquity on marveled that such a savage giant could in the flash of an eye turn “gentle as a lamb” under the touch of their human. In the home and the castle, they were a quiet, dignified, almost docile presence. These intimidating giants have deeply sensitive souls. The first thing — and often the only thing — people see looking at an Irish wolfhound is its staggering size. They should think bigger. They’re missing the most precious part of the wolfhound — his wit, intelligence, loving heart and tremendous, quirky personality. Like no other dog I’ve ever known, wolfhounds talk to you. They insist on engaging you with a deep, expressive gaze. “Old souls” is how many wolfhound owners describe them. If a breeder trusts you to take one home, forget the word “pet.” This is the start of an intense, incredibly rich relationship. First and foremost, a wolfhound wants to be with you. You’re his human. He’ll treat you as an equal. In time, you’ll understand that this is an honor. A good breeder will want to know if you’ll include your furry companion in family activities and outings or frequently leave her in a kennel or X-pen for convenience. A wolfhound won’t strike you as needy. They’re stately and unflappable. But keep them apart from their family and watch them sag. Most dogs study their humans. Wolfhounds will watch you and stick beside you so closely that they’ll know what you’re about to do before you do. Will you watch them as faithfully? There’s a tipping point as they mature where one day you’ll know their moods and quirks as well as you do your best friend’s. Because they’ve probably become your best friend. The bond is intense — if you let them in. 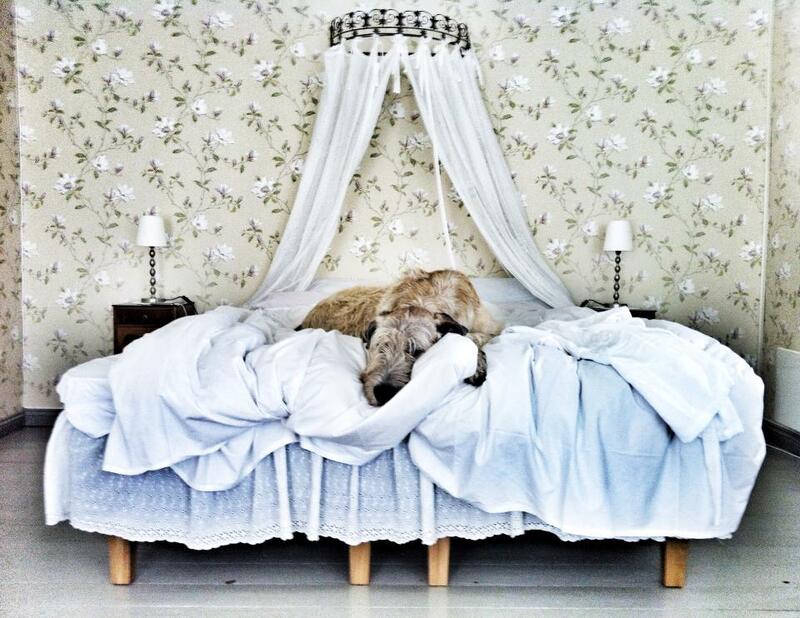 Young wolfhounds have a wild side. All puppies do. All puppies aren’t 100 pounds at six months. Restraining them, keeping them from getting hurt or ransacking your house can be trying. But you’re dealing with a baby, no matter how big he or she is. Can you be patient and loving while you peel them off the ceiling for the fifth time tonight? They may come at you with the enthusiasm of a cavalry charge, but a harsh word can cow them. Keep it tender and loving. ….because these are hounds who’ll fight for you and, if need be, die for you. You are their world. It’s a level of love and devotion we don’t see much anymore and it’s a humbling thing. Was it really just happenstance? A wolfhound is a lodestone. You may have thought you were getting just another dog, but they’ll cast a giant shadow over your days. You’ll find yourself doing things or avoiding things because of their primal sense of ethics. You’ll come to love them with a selfless love and never want to let them down. Through them, you’ll find your True North. They leave that kind of mark on our lives. And I believe it’s up to us to embrace the soul of the Irish wolfhound and help them, too. Help them fit into our crazy human world. Help them be the best wolfhound they can be. Help them with all our love and respect. Just as they’ve helped us.